Redlands, California—Esri, the global leader in spatial analytics, today announced the opening of its Storytelling with Maps Contest. Participants are invited to submit their top Esri Story Maps projects for a chance to win prizes and peer recognition at the Esri User Conference. Contest participants can submit up to three preexisting or new story maps between now and May 7, 2018. 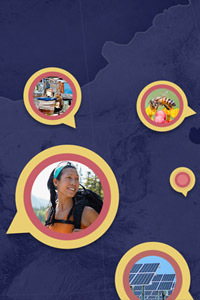 Story maps provide a dynamic, interactive way to combine maps, text, and multimedia content to tell stories about neighborhoods, communities, nations, and the world using the common visual language of geography. "This contest is intended to celebrate the many diverse and creative uses of this exciting storytelling medium," said Allen Carroll, leader of the Esri Story Maps team. "Story maps use geography as a means of organizing and presenting information, and they tell the stories of places, events, issues, trends, and patterns within intuitive user experiences." Submissions will be judged on design, user experience, impact, and overall creativity in telling an engaging story. All entries must make use of one of the Esri Story Maps apps. Entries may be hosted in ArcGIS Online or another publicly accessible server. Contest participants are encouraged to customize their Esri Story Maps apps to show off their creativity and style and to suit their audience's needs.